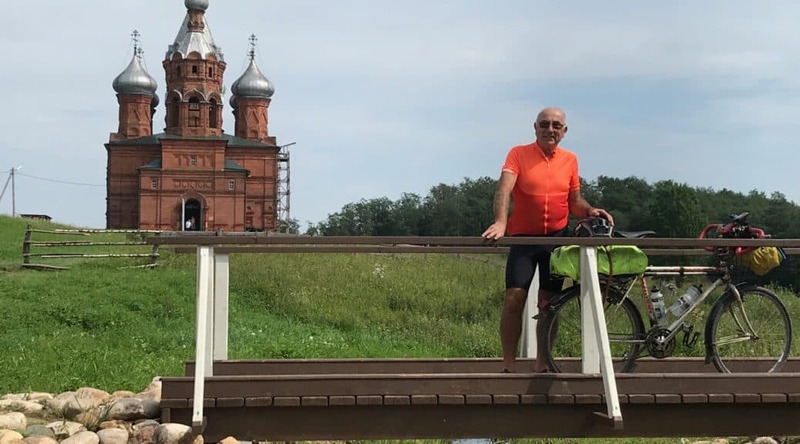 On my 71st birthday I was up bright and early ready to start the journey to The Volga’s source, , having slept OK despite how busy the Russian rail network was below me. Nowhere was open for breakfast at 5.30 so I made do with a crust of bread in my bag hoping to get more breakfast in Ostashkov. The source has a small hut over it and you can look down into the spring the whole area is quite bucolic especially with the domed church overlooking the small stream well worth all the trouble and expense of getting here. Alas there was no food only some guy selling ice cream and some home made cloudy drink which I eagerly drank as i had run out of water. I made it back to Ostashkov first at the supermarket and then onto the Lubov Hotel with its magnificent lake setting feeling totally wrecked. I eventually found a bar open and had some pretty disgusting fish and chips. In the night I became very ill with food poisoning throwing up my total stomach contents, not a good ending to my 71st birthday.